Didn't I just announce a big bonus giveaway at Intertops?! Well, here they go again! 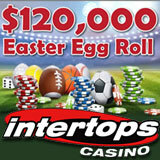 The $120,000 Easter Egg Roll bonus giveaway has just begun at Intertops Casino and online casino players from around the world are competing with each other for top ranking and top prizes. You earn points just by playing at Intertops and this month top point scorers will win weekly bonuses up to $800 each. Current rankings are displayed on the live Easter Egg Roll leaderboard. Every week until April 28th the top 250 players will receive a share of $30,000 in weekly bonuses. The top 15 from each week will be entered in a random draw at the end of the month and one player will win $1000 cash. For some players, it’s not just about the prize money. “I’m telling you, you can get more obsessed with your position on the leaderboard than how you’re doing on the slots!” laughed one player. You can check the leaderboard for your current rank any time (http://casinopromotions.intertops.eu/eggroll). Every Monday until April 28th, the player that earned the most points the previous week gets an $800 bonus. $700 goes to the second player, $600 to the third and the next seven players each get $500. Every week 250 players get a total of $30,000 in bonuses. If you're really on a roll and place in the top 15 any week during the month-long competition you'll be entered in a draw for a $1,000 Goal Line grand prize on April 29th. Every Thursday the Free Shot Draw will award bonuses up to $150 to players that have played Monday to Wednesday that week. Easter Slots Tournaments are currently underway in the Intertops Casino Classic (which you can play in with your regular Itertops account).